Let’s face it, I don’t get out very much. I spend most of my time sitting behind a desk or in a conference room. That’s why I value the opportunity to meet with people from around the country who are doing the hard, and sometimes draining, work that needs to be done to fight stigma, prevent new HIV infections, and keep people living with HIV healthy and their viral load undetectable. Maybe it’s the researcher in me (or my analytical Virgo nature), but it is incredibly important to me to hear and learn from the experiences people from all over the country whose lives or careers have been changed by HIV or viral hepatitis. It keeps the work that I do grounded; it keeps me motivated; and it keeps me from losing sight of the needs and experiences of the programs we support and the people we serve. Their recent paper on the state of HIV in the “Deep South” published in the Journal of Community Health. Barriers to HIV treatment in local jails that make it difficult for people living with HIV to get and continue taking their HIV medication in jail and reconnecting with HIV care in the community when they are released and return to the community. Transportation can be an even greater challenge in the Deep South where a greater proportion of people living with HIV are outside major metropolitan areas. As a result they often have to travel further for HIV medical care, treatment and services. 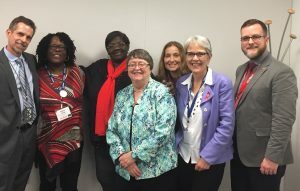 A desire for greater transparency into how federal HIV prevention and care funds are being spent by states in the region and more timely accounting of any under-spending by subcontractors so any under-spent funds can be reallocated to other areas in need. Differences in the ability to respond to HIV prevention, care, and treatment needs in states that expanded Medicaid eligibility versus states that did not expand Medicaid. The impact of Ryan White HIV/AIDS Program Part B eligibility rules have on the ability of Southern states to apply for supplemental funding opportunities that support HIV care and treatment. The potential for PrEP to be a powerful HIV prevention tool in the region, but the potential not being realized because of a need for federal funding that would pay for the necessary lab tests and medical visits. The suggestion that grant writing capacity building assistance is needed for health departments, community-based organizations, and others in the region; and related concerns about lesser-funded agencies competing against much larger, better funded organizations. A request to consider changing how some federal funding decisions are made to allow for applications to be evaluated on a regional basis. This would involve establishing funding levels for regions and ranking proposals on a region-by-region basis. This would allow agencies serving people in a given region to compete with each other rather than competing with organizations in areas that have historically received more funding and, as a result, have built up capacity in ways that the areas that have been historically underserved have not. A need to enhance provider competency in serving transgender persons. The impact of HIV-related stigma and the need to expand efforts to combat it came up again and again during our discussion. Some of the participants living with HIV shared stories about how powerful social stigma is in the communities where they live – sometimes even preventing people from picking up their medication or going to healthcare appointments. One participant discussed her own 18-month delay between her diagnosis and starting treatment due largely to her concern about the stigma she may experience. Years later, she is now not only in care, but she’s an advocate who leads a self-advocacy group for women living with HIV to help build their resilience to such stigma. Even though our lives and our stories are diverse, I’m struck by how universal the things that those of us living with HIV experience are. We have so much to learn from each other. We are making progress as a nation, including in the Deep South, on reducing HIV infections, illness, and deaths. Although southern states are improving on these critically important indicators, the amount of change and the rate of change are not as great as we have seen in other areas. As a result, regional disparities have gotten worse and some people and places are being left behind. The National HIV/AIDS Strategy recognizes the need to improve outcomes in southern states. People living with HIV in the south should have the same opportunity as everyone else to receive effective HIV prevention, care, and treatment services so that they have the same chance as other Americans to live long, healthy, and productive lives.